What is the total debt per US Citizen? Ever wonder what the total debt per US Citizen is? Do you know what the US budget is for Medicare, Social Security, and Defense? Or how about our trade deficit with China? 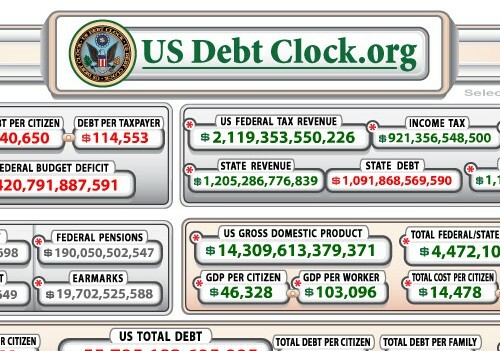 I stumbled across this real-time clock that shows a wealth of information regarding our national debt, but most of all, just how deep our country has dug itself. Feel free to take a look and get depressed. Visit USdebtclock.org.